There was one hitch to the variety of play – sudden snow in late April, but the sun still made its way through the clouds. The participants saw a special sign in it, namely irreversibility of the arrival of spring, which Low Sunday actually symbolizes. 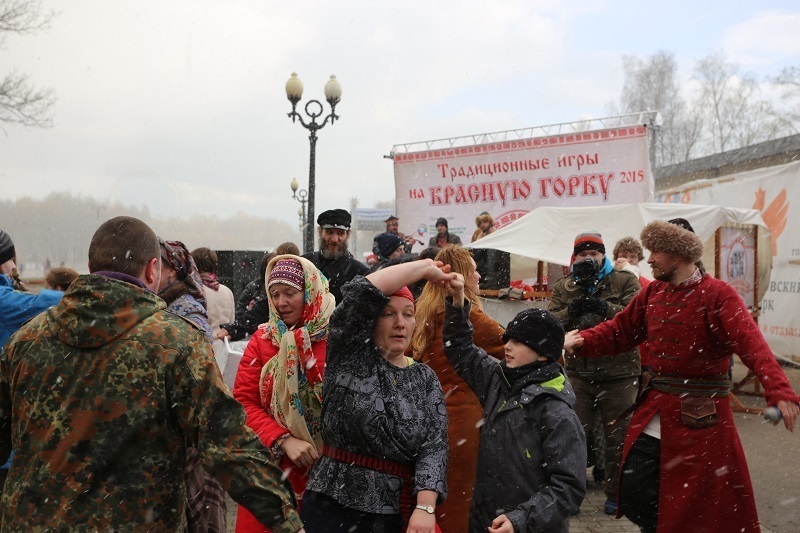 As always, fans of Rusmyach (Russian ball) and Kila, traditional wrestling za-vorotok, stick pulling, ryukhi game (skittles), traditional archery, klushkovaniye (similar to hurling), and stand-up fight, gathered on this occasion. Teams of the City Dzerzhinsky, Korolev, Mytischi, Belgorod, and Tambov arrived specially for participation in the Moscow games. Stand-up fight became the concluding activity to the games. It was held in two versions - as primordial pugilism and as a kind of ethnosport stand-up fight, whose rules were designed by the "Belogor" club from Belgorod City. The 4 teams of 7 people participated in the Belgorod version. Dancing and singing contests judged by Aleksey Shilin, Honored Worker of Culture of the Russian Federation, and Professor of the Russian Folk Singing department at the Moscow State Institute of Culture and Art, Head of the Choreography department at the National Centre of Russian Folklore. The event was held with the support of the following partners: the Fund for Protection of Historical and Cultural, Spiritual and Moral Foundations of Russian Civilization "Svyatoslav", Creative Association "Play City" of the State Republican Center of Russian Folklore, Martial Arts Center "Russian Sparring", Wall to Wall Close Fight Club (Moscow), Hand Combat Club “S.W.O.R.D.”, Club of Combat and Ethnosport "Slavs", Russian Ancient Martial Arts Club "Kolo", the Regional Public Organization "Youth Choose the Sober Capital", the Municipal Educational and Methodical Center "Zvenislav", a non-profit partnership "Atmanovskiye Fists", Center of Patriotic Education "Stratilat", the State Academy of Slavic Culture, Center of Living History "Present Past", and the amateur ethnosport and folk groups. Best team- Russian Ancient Martial Arts Club "Kolo"